Your wedding photographs will be the key memento of your special day. You start by spending lots of time and money prepping and posing so that they turn out just right. But then, what do you do with them? Put them in a photo album? Store them on your computer? Surely, there can be better ways to enjoy and showcase them! We think we 've found just the thing! 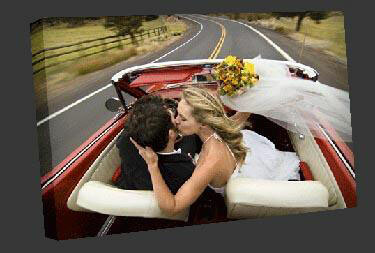 Posterjack: a Canadian photo enlargement company, which uses state of the art technology through advanced printers and printing software to preserve and showcase your favourite wedding photos as works of art. And, just like their name suggests, PosterJack prints things big, poster-size big. Check it out! Take your favourite engagement photo and have it enlarged then bounded by a thick white border. Display the photo at your reception and encourage guests to sign the white border instead of a guest book. (like this one, but bigger!) The collection of signatures and notes of congratulations along with the photograph create a wonderful memento of the day and all that attended. Can't decide on one picture? Would you like to display your engagement photo along with family photos and pictures of you as children? Perhaps, a photographic journey of your romance is something you would like to share with your guests? Posterjack's collage service allows you to design a collection of your favourite pictures into one poster. Mix and match photos, add backgrounds and even text. You be the designer; then, have Posterjack take it from there to bind your creation with a thick white border that guests can sign. Voila! Instant keepsake! Tip: after the wedding, a collage of your favourite wedding photos would make fantastic gifts for your parents and bridal party! Today's wedding photography is considered an artform in itself. Portraits, candids, and breathtaking outdoor shoots take centre stage and leave us with more than just a record of the day's event. Posterjack's service offers a number of different formats to showcase your favourite shots as (affordable!) pieces of art in your home. Quick, easy, and timeless. Posterjack's frames consist of Canadian made components, like the hardwood frame, the low glare framers acrylic and the off white acid- free mat board. Plus, by offering their frames in one style and one colour (black) only, the ordering process becomes extremely easy. Photos you can stick right up on your walls? Why not? This is a great option for adding photos to concrete walls, windows, or painted walls without having to nail or screw anything in. This special paper adheres easily to surfaces and can be removed and reapplied easily without damaging surfaces or paint: a fabulous option for renters and those not so handy with a hammer! Canvas prints are a very modern approach to wedding photography. Posterjack can print your favourite photo onto an artist's canvas and gallery wrap (photo extends around the sides of the frame) it around a 1.5" inch deep wooden frame. What's even more special about this option is that Posterjack's canvas' are made in Canada with a 60/40 blend of cotton and polyester and are whitened with an environmentally safe process. The final result is a breathtaking focal piece of art. Posterjack specializes in enlargements (up to four feet tall..) but you can choose from a variety of sizing options to accommodate your particular needs. A simple 3-step process gets the order going. Simply (i) choose a product, (ii) upload your photo then (iii)select a size. Once this is done, a special feature will grade the quality of the image in comparison with the size selected. A score from "unsuitable" to "ideal" will alert you to how your image will turn out before it's actually enlarged. No surprises. 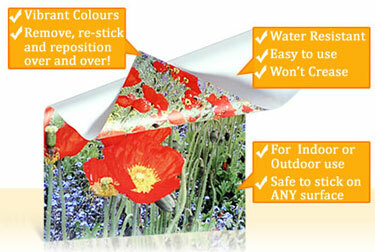 All orders can be made through Posterjack's online store and shipping is available throughout Canada. For those in the GTA, local pick up can be arranged.